Lavender is everything millennial pink isn’t and then some: that laid-back, calm-inducing hue that all the cool girls are wearing. The soft purple hue and its various iterations – lilac and duck-egg blue, we’re looking at you – can be found in knits, suiting, tulle skirts… you name it. Buy it now: A pinstripe lavender shirt will give your nine-to-five look that je ne sais quoi appeal. 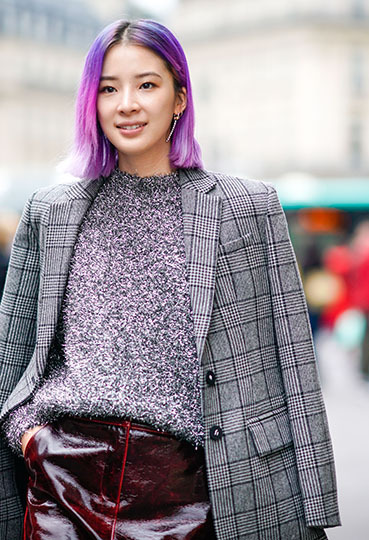 If you’re bold enough to sport lavender from head to toe, style an oversized lilac blazer with slim-fitting orchid-hue trousers and finish the look with horse-bit leather loafers. Doodles, scribbles and screen prints – oh my! Everything fit for the art-school dropout. The new season is all about getting artsy with daytime dresses, duster coats, tote bags and everything in between. Statement dressing just got an arts and crafts stamp of approval. Buy it now: A paint-splattered shirt dress may be simple but oh does it demand attention. Not to mention that it’s the perfect partner to Balenciaga-esque leather buckle boots. If you want to go down the trendsetter route, a doodle-covered pea coat will out-do just about every statement coat in the vicinity. From Dolce & Gabbana’s rainbow stripes to kaleidoscopic colourblocking at Libertine, the runway is having a love affair with bold colours, because the future is rainbow bright! The good news is that there are no real rules to wearing the look: just wear a lot of colours and wear them with your head held high. Buy it now: A rainbow-striped leather shoulder bag is guaranteed to enliven your wardrobe and your daytime look without going full party clown. As for wearables, a midi dress with multi-coloured asymmetric stripes spells minimalist chic. No, not the Mean Girls frenemies rendition, we’re talking the see-through, waterproof material that has made a noteworthy comeback. From rainwear to head gear – visors anyone? – and even translucent thigh-high boots, it’s a plastic-fantastic season: so you had better embrace it. Buy it now: A rubberised knee-length trench coat with contrast piping is both rain-repelling and really good at winning you style points. Brown leather-look vinyl trousers – paired with a turtleneck and a leather bumbag – is how the ‘It’ girls will be tapping into the trend. Basic spaghetti straps are, well, so basic. Printed, pearl and sequin-embellished straps are the heavy hitters that will instantly elevate a plain black or white camisole and guarantee that you stand out. Meet your new wardrobe heroes. Buy it now: A slinky little black dress with gem-embellished straps is the no-frills way to do cocktail attire. Just add platform pumps.